into the future, just like the song says. Sometimes I feel like the Doctor must be messing with the fabric of time because, for instance, how can it already be two weeks since I last updated my blog? 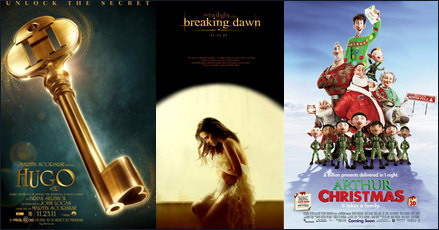 What has happened during all that time (aside from my trips to the cinema to watch Arthur Christmas, Hugo and Breaking Dawn)?? Shouldn't I have more to show for it? Now, if the Doctor is fooling around with time I'm sure it's in the service of good and that the earth has just been saved from maleovalent aliens but for our own sake we haven't been allowed to remember it. If this is the case I heartily thank the Doctor for once again rescuing humanity (and humbly request that he consider doing something about getting us Canadians a half decent Prime Minister). Either way I'm hoping to get much more writing done next week because I'm falling behind in my new book and have left the main character alone in the middle of a very precarious situation for far too long. Let me tell you, she's not happy about this. I'm probably going to hear alot of crap from her when I get back to the book! Meanwhile in real life I've acquired a case of shopping mall sickness which comes from having been in four shopping malls (five if you count the Atrium on Bay) within the last three days. Not that I've bought alot mind you, but I've spent hour upon hour there just the same. I think shopping mall air must be similar in quality to airplane air because I feel generally lacklustre and am exhibiting the symptoms of a head cold. Today the Santa Claus in Dixie Value Mall wished me a Merry Christmas as I passed him, without me having to sit on his knee or anything. Hopefully the good vibes will set me right again soon but while I'm on the subject how ridiculous is it that while even a discount shopping mall has a real-life Santa to visit Toronto's Eaton Centre has nixed this longtime tradition in favour of offering Skype visits with Santa? That's a big bah humbug of an idea to me. So much of daily life now is already divorced from reality and spent interacting with electronic devices. The cool thing about being able to meet a mythological figure like Santa live in the flesh is the fact that, well, he's live in the flesh. 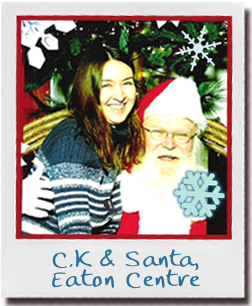 And it's doubly a shame because the Eaton Centre used to have some of the best Santas around (I was so entranced by a particular one that I felt compelled to go have a chat with him myself a few years ago, picture at right). 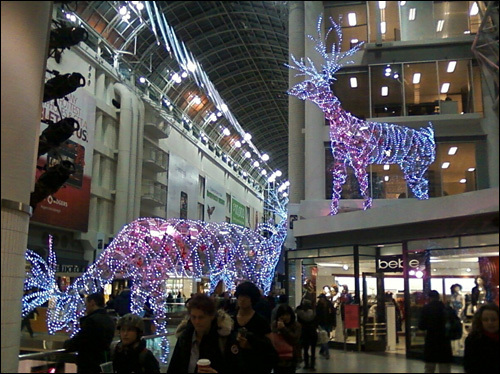 Great job with the cool illuminated giant deer decorations, Eaton Centre, but thumbs down on the too cool for school Santa Skype idea. During my time in downtown Toronto yesterday I had a chance to check out G for Gelato at the corner of Adelaide and Jarvis. I'm a total sucker for gelato and after reading the Toronto Star review I was all excited to stop by. Trust me, if you're as big a fan of gelato as I am you should go too. So yummy (I had the pistachio)! And my husband really enjoyed their espresso too. Anyway, I hope you'll forgive me if I stay away from the blog a little longer to try to make progress on my current book. By the way, the other day I noticed that my next book, Yesterday, has been posted on Goodreads. It doesn't hit shelves until next September so there's no finalized cover yet but I'm excited to see it just dipping its toe into the pool of existence at this stage and when I can, I'll definitely say more!